All Posts Tagged With: "2012 Golden Globes"
Hollywood’s top makeup and hair talent have share with TM & Marta Walsh their inspiration, “how-to” steps and the L’Oréal Paris and Matrix products necessary to replicate the stunning styles seen on the following celebs at the 2012 Golden Globe Awards. Inspiration: For Dianna’s makeup, Monika was inspired by the spring 2012 fashion shows where the makeup was fresh but still very glamorous. Since Dianna’s red Giles dress was so “va va voom,” Monika focused on the lips to be the stand out feature. Love it or Hate it. And I think Kim Kardashian is getting better on the red carpet for award shows since last I remember her. Not the worst dressed compare to A-List celebs at the Golden Globes last night. I said it. Kim Kardashian wore Bruce Oldfield Couture at last night’s official after-parties for the 2012 Golden Globes. First, Kardashian arrived at the 13th Annual Warner Bros. and InStyle Golden Globe Awards After-Party in a Bruce Oldfield black beaded lace gown. Kardashian then graced the red carpet of the Weinstein Company 2012 Golden Globe After-Party stunning in the Bruce Oldfield creation. Steven Spielberg wore a notch lapel TOM FORD tuxedo, evening shirt, bowtie and pocket square to the 69th Annual Golden Globe Awards on January 15, 2012 in Los Angeles, California. The first I’ve noticed last night when I saw Claire Danes at the 2012 Golden Globe Awards was her super clean blonde hair. It was the real deal blonde and as I like to call it Hollywood Blonde. TM & Marta Walsh has got the scoop about Claire’s hair color from Steve Amendola, colorist at the Serge Normant at John Frieda Salon in New York. Steve colored Claire Danes’s hair for the 2012 Golden Globes. Celebrity Makeup Artist Gita Bass created Tina Fey’s stunning makeup look for the 2012 Golden Globe Awards tonight, using Votre Vu makeup and skincare. Talking about a fresh and pretty look on the red carpet tonight at the 2012 Golden Globes …love everything about Nicole Richie’s look! Sometimes without trying too hard to look serious on the red carpet you can actually pull out a remarkable style. This look is very Marta:) Also, love the bold bangs and ponytail. I would love to get an appointment with Ms Richie’s stylist, makeup artist, and hairstylist, ha. BTW Nicole Richie’s gown at the 2012 Golden Globe Awards by UK fashion designer Julien MAcDonald. LUV him from Britain’s Top Model, he was one of the judges with Elle Macpherson. 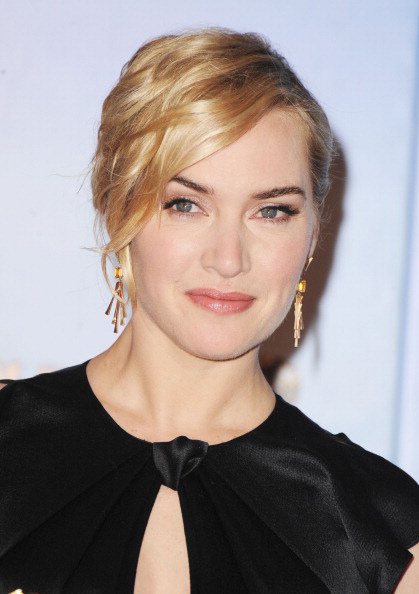 Lancôme ambassadress Kate Winslet’s makeup look for the 2012 Golden Globes was created by Avon Global Creative Color Director Jillian Dempsey. Celebrity Manicurist Michelle Saunders used a mix of essie’s Lady Like ($8) and Au Natural ($8) to compliment Kate Beckinsale’s gorgeous cream dress.